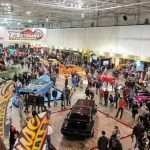 Celebrating the Hot Rod and Custom Car culture and lifestyle, ‘Motorama Mayhem…in the Backroom’ is the latest feature in the Motorama Custom Car & Motorsports Expo line up, the ‘show within a show’ occupying the 30,000 square foot Hall 3 of Toronto’s International Centre. 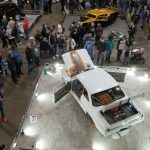 Extending well beyond the boundaries of simply being a static vehicle display, Motorama Mayhem…in the Backroom will also encompass all the associated interests of the lifestyle, including music, art and clothing. Appearing on the Zehr Insurance Stage for all three days of the Motorama show will be DJ Swankenstein, spinning the Rockabilly tunes. A trio of live bands will spell off the DJ on Saturday afternoon and evening, with two Wild Records bands headlining the event. Toronto’s own Greasemarks will tee things up for the red-hot Rhythm Shakers. The Los Angeles-based band is making its Canadian debut at Motorama! Another local Toronto band, The Royal Crowns, have come together and will be the opening act of the evening on the Zehr Insurance Stage. 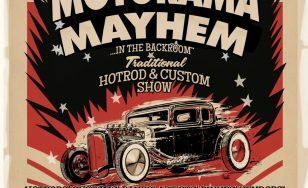 Added attractions in the Motorama Mayhem hall include pinstripers, various artists showcasing their ‘one of a kind’ creations, tattoo artists, a barber, plus vintage clothing and collectible vendors. 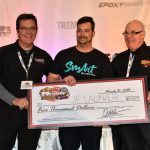 One highlight of the Motorama Mayhem…in the Backroom that is sure to attract attention from show visitors is the Miss Motorama Pinup Pageant. Hosted by Suzie from Suzie’s (‘rock your inner pinup’) Bombshell Boutique, and featuring celebrity judge Cherry Dollface, the family-friendly Pinup Pageant will celebrate the ladies who live and breathe the pinup culture, all vying for a share of the $1,000 in cash plus other prizes. Miss Motorama will also receive a private ‘one on one’ hair and makeup session with Cherry Dollface. The Miss Motorama Pinup Pageant is the richest pageant of its kind in Canada. Contestants will be judged on authenticity, originality and vintage-inspired accuracy of clothing, hair and makeup in line with classic pinup styling, plus poise and personality. ABOUT ZEHR INSURANCE BROKERS LTD: Based in New Hamburg, ON, Zehr Insurance Brokers Ltd. has been a Motorama Show participant since the initial show. 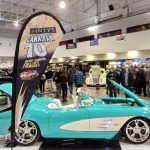 This year, they have expanded their involvement, sponsoring the Motorama Mayhem…in the Backroom exhibit, as well as the Zehr Stage. Zehr Insurance Brokers Ltd. offer traditional products such as residential and recreational property, car, farm, business, construction, manufacturing and life and financial services, but their specialty programs include coverage for Vintage vehicles. Under the ‘Vintage C.A.R.S. (Classic, Antique, Rod and Specialty)’ banner, Zehr Insurance Brokers Ltd. offer insurance products for both individuals and special interest car clubs. For all of your insurance needs, visit the Zehr Insurance Brokers Ltd. website: www.zehrinsurance.com.